With a sea change in India's image thanks to 1.2 billion Indians, people are saying that the 21st century belongs to India, Prime Minister Narendra Modi told a mammoth crowd of Indian diaspora here. "Everybody agrees the 21st century is the century of Asia. But today, people say, the 21st century belongs to India," he said addressing a jam-packed San Jose SAP Centre on Sunday night. "This change is not because of Modi, this change came because of 1.2 billion Indians," Modi said amid chants of his name.Modi also saluted Indian techies for changing the image and perception of India with the magic of their fingers at the computers. "Today there is a new image of India, a new perception of India in the world," he said. "People are moved to change their perception of the old India," Modi said. "This is the magic of your fingers at the computers. ""Sitting here, with your innovations, you are compelling the world to change. And the people who refuse to change, are soon going to become irrelevant. ""The biggest thing, American citizens feel proud of is the people of Indian origin," Modi said. "I congratulate you for this, I salute you." Earlier India's identity were the Upanishads, the prime minister said. Today in the field of science, India has made a new identity. India, he noted is the first country to be successful at Mars mission in its first attempt.Amid loud chants of "Modi, Modi", the prime minister said: "I'll live for the country, I'll die for this country. ""Every moment of my life and every particle in my body, I will devote to the work of my country," he assured the crowd and asked, "Have I done good work? since he came to power 16 months ago. The crowd cheered in approval.Taking a dig at opposition Congress, Modi said, "It doesn't take much for politicians to get allegations to their name. The people of India are sick of corruption. ""What can't the country do, which has the strength of 800 million young people. This country now, can not be left behind," Modi said. "If in the 19th Century, my Sikh brothers came here as farmers and were restless for the independence of India. Today, in the 21st century, my countrymen will fight for India's poverty," he said. Modi recalled his first trip to the US last year when he was given a rock star like reception by the Indian diaspora at the Madison Square Garden in New York.As promised by the organisers, the Sunday night reception indeed rivalled that of the New York event. "A Madison Square Garden moment for Silicon Valley. 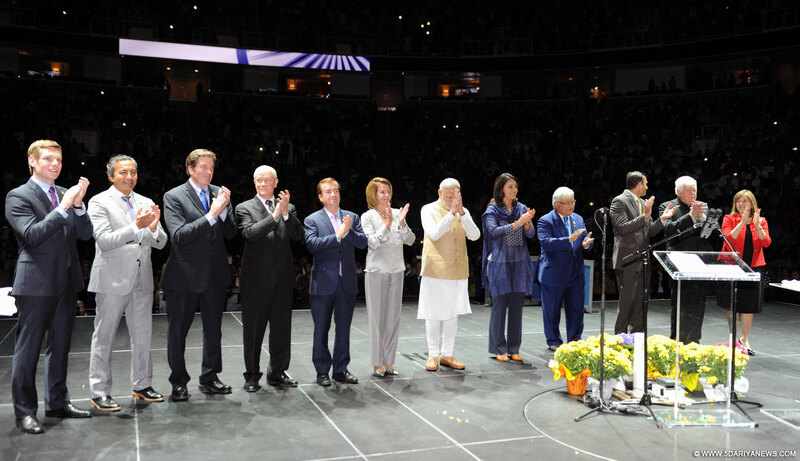 The SAP Center is jampacked as PM @narendramodi arrives," tweeted external affairs ministry spokesperson Vikas Swarup.The crowds chanted his name as the prime minister dressed in white kurta and churidars and a light cream Nehru jacket walked to the stage of San Jose's SAP arena.Before he started speaking Modi was introduced to several US lawmakers from California, including the lone Indian American Congressman Ami Bera, whose parents hail from Gujarat and Democratic Minority leader and former House speaker Nancy Pelosi.At the outset Modi paid tributes to Indian freedom revolutionary Shaheed Bhagat Singh on his birth anniversary and exhorted the crowd to respond to his call of "Vir Bhagat Singh" with "Amar Rahe Amar Rahe".